The Eternal Castle: Remastered is an admittedly bizarre game with an even more bizarre backstory. Describing itself as “a remake of the original ‘Eternal Castle‘ from 1987,” you’re probably thinking that this is a remake of a very old game — which is exactly what the developers want you to think. …But all of that’s a total lie. Because the truth behind this game is purposefully being obscured, allow me to lay all on the table of you; The Eternal Castle: Remastered isn’t a remaster at all. It’s an entirely new game. A new game made to look and feel like it’s a product of the late 1980s, but a new game nonetheless. I’ll give the devs credit, here, because they certainly got all of that down. From the graphics to the gameplay, and everything in between, every single part of this game screams “old-school”. And, while that doesn’t always work in its favor, there’s no denying that playing through The Eternal Castle: Remastered makes for a unique gaming experience. Out of the frying pan and into the fire, eh? Taking place in the enigmatic year 2XXX, The Eternal Castle: Remastered follows the story of a lone soldier who, while journeying to Earth in order to find a now-missing AI who had originally been sent there in order to procure resources, was attacked and subsequently crashed their ship. Stranded on a hostile and mutated Earth, the soldier must now begin the journey to collect the four missing pieces of their ship (known as “GLIDERS”) which broke off during the crash and make their way once more to the AI in hopes of putting an end to things once and for all. Phew, this game’s story is a doozy. It’s not because it’s lengthy, though. Nor because it adds in so many unnecessary details that it’s hard to keep up with. Rather, it’s because it so accurately follows the storytelling format of the source material that it was inspired by. While dialogue does exist within this game that does tell a story, it simply doesn’t feel like enough to properly convey a narrative. In all honesty, I didn’t really know what I was doing, and the game never really gave me much of a reason to care. Now, I know you could potentially counter this. “That’s how games from that era were,” you might say, “and the fact that this game remains somewhat obtuse is all a part of the experience!” To be fair, I guess that you could be right. But that doesn’t change the fact that I wish that the game gave me a little more to deal with. Heading back to a mutated and destroyed Earth in order to rescue a rogue AI is a really neat premise, and the game paints an incredibly interesting story when it does decide to cough up bits of the story. I just wish that it did a better job of tying everything together. Jumps sure can be scary in this game. Have you ever played Prince of Persia before? 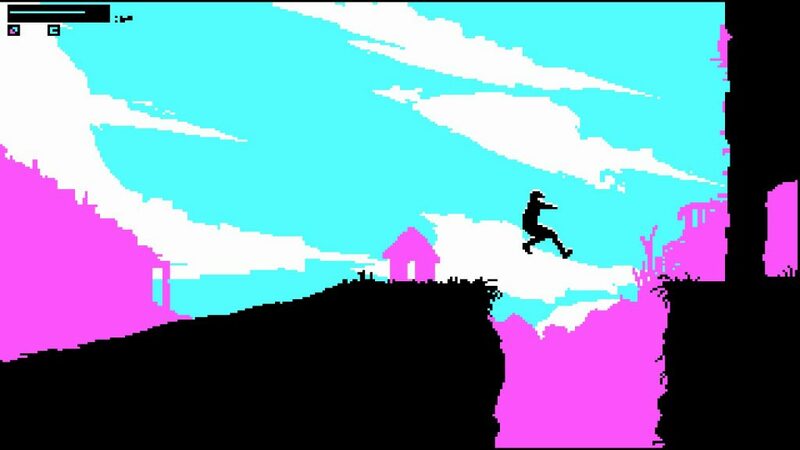 No, no, not the re-boot with Sands of Time; the original 1989 Prince of Persia for PC. If so, then you’re in luck, because that’s essentially how this game plays. For those of you who haven’t, however, I guess I should probably explain what’s going on. For all intents and purposes, The Eternal Castle: Remastered is an action-platformer, whose gameplay largely consists of beating down and shooting up baddies, jumping over pits (although that one should be a given), and exploring your surroundings. There’s a catch here, though. Well, okay, it isn’t a “catch” so much as it is something that you need to keep in mind before diving into this game; this game is made to feel very old. And I’m not talking about Super Mario Bros. old, here; it feels even older than that. I’m talking DOS-style old, here. And that, my friends, is both the source of great strength and weakness. On the positive side of things, The Eternal Castle: Remastered, overall, does a bang-up job of exemplifying how these old-school PC titles felt. 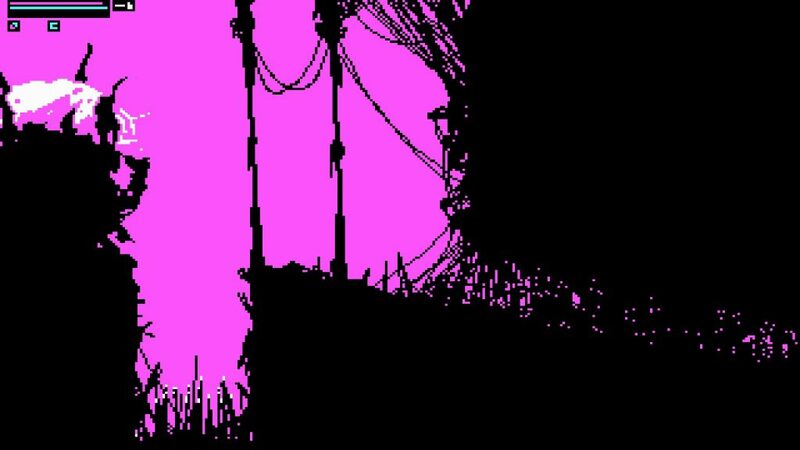 Everything from the careful and deliberate way that characters, especially the player’s, move, to its charmingly (and sometimes jarringly vibrant) 2-bit CGA graphics exudes nostalgia in a way that many retro-inspired titles could only hope to do. In all honesty, it wouldn’t be hard to convince people (which I suppose that the developers actually tried to do in their marketing campaign) that this is literally just a slightly polished version of an already-existing, and very old, game. It really does feel that way. I wasn’t interrupting anything here, was I? While it isn’t exactly connected to its heavy nostalgia factor, yet another point that The Eternal Castle: Remastered does fairly well with is with the uniqueness of its levels. It’s no secret that 80s games weren’t exactly what you would call “diverse”. While these games did the best that they could, and there were certainly some excellent titles that came out during that time period, it wasn’t hard for many of them to fall into a level of “mundane-ness” so high that it just felt like you were doing the same thing over and over again. Well, there’s honestly not too much of that with this game. Despite never diverging from its action-platforming roots, each of The Eternal Castle‘s levels does feel fairly unique — a fact which the game actually points out itself during the level selection screen. 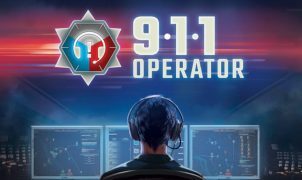 Whether you’re craving CQC, a bit of run-and-gun action, or the chance to stealthily sneak your way past your opponents, this game’s got you covered. While that in and of itself would be appreciated by normal standards, the fact that The Eternal Castle manages to do this without sacrificing too much (and most of the time, none) of its old-school feel is nothing short of impressive. I’d tell you where I am in this picture, but I honestly can’t remember. The fact that The Eternal Castle: Remastered looks, feels, and plays as old as it does is, as I’ve already said, a huge boon. …But it’s also kind of a weakness. As much as I appreciate this game’s passionate old-school-ness, it also reminds me why, generally speaking, evolution within the video game industry is a good thing. Take the picture above, for example. I’m fairly certain that I’m somewhere off to the right. But that’s only because I’ve played this game and took that picture personally. Even then, however, I can’t be entirely sure — and that’s because I can’t see my character. As much as I’d like to wave this off as a one-time occurrence (which I would happily do if that were the case), it isn’t. Due to the graphical choices of the developer, it becomes astonishingly easy to lose sight of where your character is during certain parts of the game — many of which involve needing to be sneaky or needing to move quickly. Getting through these areas is by no means impossible — my victory over the game is proof of that enough — but it doesn’t change the fact that it’s frustrating. I’m okay with losing because something’s legitimately challenging. I’m not okay with losing because of an unfair gimmick. While it doesn’t bother me as much as not being able to see my character, I also found the game’s character responsiveness, as well. Now, before getting into things, I’ll admit that this is definitely the most subjective part of this review (although what part of a review isn’t subjective?). 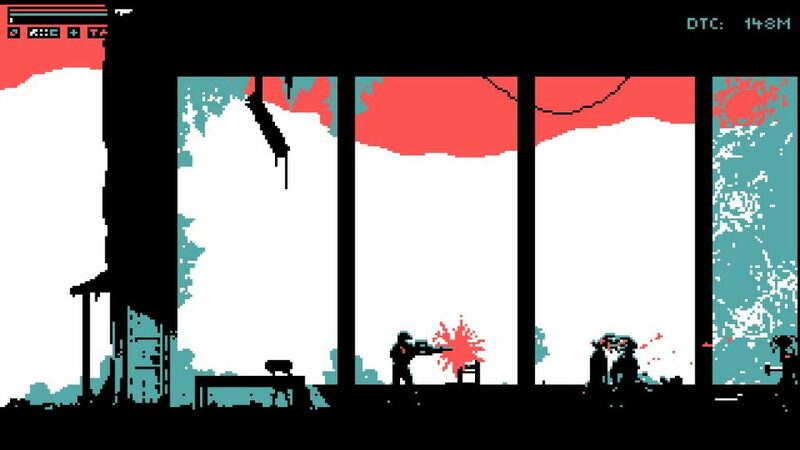 I get that this game is supposed to mimic those released in the 1980s, which it ends up doing incredibly well. And for those of you who like your games to feel that old (no disrespect if you do! ), then you’re set. But, for the rest of us, the lack of overall fluidity can be a little jarring. The deliberate movement with which the player’s character moves isn’t something that you’re going to get used to right away. Every action, especially jumping, takes a little bit of time, meaning that you’re going to have to become better when it comes to the actual timing of your button presses. Fortunately, this becomes much less of an issue once you do get used to it (which you will, so long as you keep playing), however, I won’t deny that it’s somewhat off-putting at first. 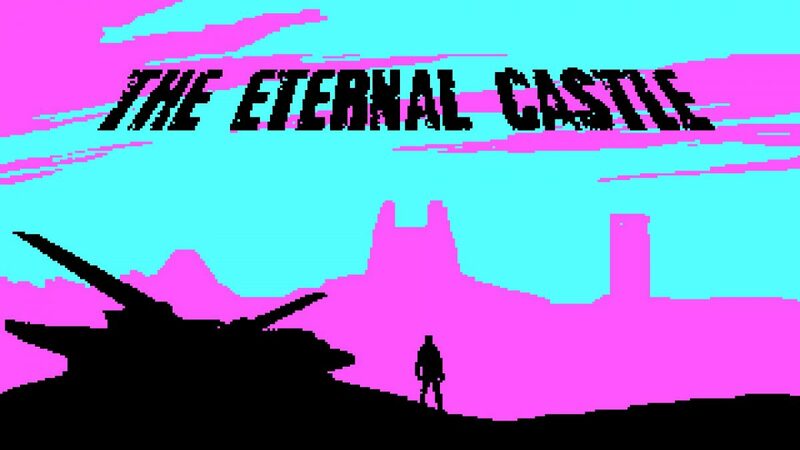 The Eternal Castle: Remastered is what you would call “niche”. A remastered version of a 1980s game that literally didn’t exist, this title goes out of its way to deliver the ultimate retro experience, and ends up being successful in its endeavor overall — a fact which, depending upon what side of the fence you’re on, is either a major draw or a huge turn-off. I can’t say that I’d recommend this title to everyone, but I don’t think that that’s necessarily a bad thing. It knows what it wants to be, and goes for it. And, so long as you’re into titles like this, then you’ll probably end up appreciating it for everything that it does. Full disclosure: This review is based on a copy of The Eternal Castle: Remastered given to Hey Poor Player by the publisher. Starting out with nothing more than a Game Boy and a copy of Donkey Kong Land, Kenny has happily been gaming for almost his entire life. 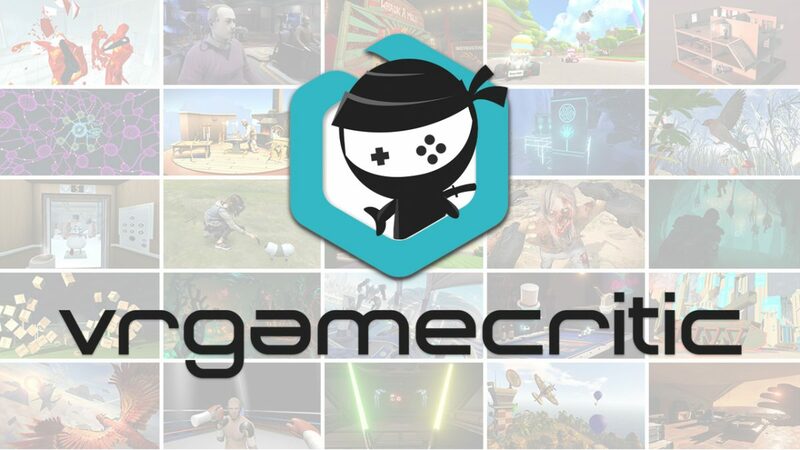 Easily-excitable and a bit on the chatty side, Kenny has always been eager to share gaming-related thoughts, opinions, and news with others and has been doing so on Hey Poor Player since 2014 and has previously worked with both PKMNcast and SCATcast. Although his taste in gaming spreads across a wide number of companies and consoles, Kenny holds a particular fondness for Nintendo handheld consoles. He is also very proud of his amiibo collection. You can also find him on Twitter @SuperBayleef talking about video games and general nonsense. Some of his favorite games include Tetris Attack, Pokémon Black Version 2, The World Ends With You, Kingdom Hearts: Dream Drop Distance, Yo-kai Watch, Donkey Kong Country 2, Super Smash Bros. for Nintendo 3DS, Kirby's Dreamland 3, Mega Man X, and Castlevania: Order of Ecclesia (among many others).